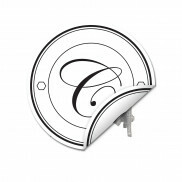 Security for all sectional radiators, with added style. With refined lines and a nod to the city we call home. For a subtle addition to every interior. Whitworth wall stay has crisp edges, trapezoidal clamping plates and a clean, circular end cap emblazoned with Manchester's worker bee symbol. Named after the Manchester engineer who standardised the thread form that enabled the city's industrial rise, Whitworth is our homage to the capital of the North that we call home. Suitable for use with all cast iron and steel multicolumn radiators. Available in all nine finishes, there's a Whitworth to match every valve we stock and to complement every radiator finish in our range. Forged and milled from solid brass, Whitworth will outlive us all. Naturally, it's covered by our Ironshield Guarantee.